UCT students and staff commemorated Mandela Day on 18 July by planting the seeds to fuel the hungry bodies and minds of the next generation’s. Excited learners at Athlone’s Hazendal Primary School could hardly wait to dip into the nearly 100 books they received from UCT Libraries on former statesman Nelson Mandela’s birthday. The library’s transformation committee had pledged to collect 67 books to donate to the school’s library – which principal Warren Rossiter noted was still a library-in-the-making – on the recommendation of UCT’s Schools Development Unit. Only too happy to exceed that target was Cyrill Walters, chair of the libraries transformation committee. She hoped that the donation symbolised the beginning of a mutually beneficial relationship between UCT Libraries and local communities. “This, today, is just a small token of how we can contribute,” said Walters. But nobody can learn on an empty stomach. So the children of the Siyakhatala orphanage and day care centre joined UCT student leaders and staff in planting a vegetable garden on the premises it rents from the Kuyasa Primary School in Khayelitsha. 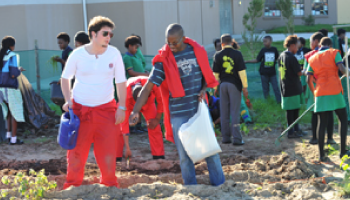 The red-overalled Students’ Representative Council (SRC), along with representatives from the Department of Student Affairs (DSA)and community workers from the area, could be seen hard at work preparing rows of Popeye’s favourite leafy green in among a variety of other veggies. Sifiso Ndaba, co-ordinator of student governance at UCT, remarked that such efforts to uplift the lives of Siyakhatala’s children, while valuable in isolation, needed to be more than just a day’s work. “We need a follow-up to this project, otherwise Mandela Day becomes a futile exercise,” he said. SRC president, Insaaf Isaacs, agreed that the 18 July should not be the pinnacle of social responsibility. “Mandela Day should be the day you find something new to commit yourself to, and should either be the day that you start to commit yourself or it should be a day of follow-up,” she said. Also diving into the action was the transformation advisory committee of the Human Resources (HR) Department (HRTAC). The committee spearheaded the collection of ten boxes and two black bags filled with blankets, clothing and tinned food during June and July as part of the department’s Winter Warmer/Mandela Day initiative. The winter essentials were delivered to the Ihâta Shelter for underprivileged abused women with young children, and the Saartjie Baartman Centre for Women and Children.